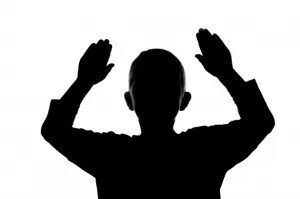 Not a holdup, but hands up and shoulders back and keep moving! I posted this a year ago, but it received such interest and more people have asked me about it, so here we go. Because of years of back problems (and now osteoporosis and arthritis) and years of sitting at a keyboard, I’ve collected exercises and advice from various sources. Today I’m sharing some that can benefit writers, office workers, and others who sit long hours at desks and/or keyboards can benefit from exercises and activities aimed at preventing carpal tunnel, neck and back and hip pain, and weight gain. Be sure you have your chair and keyboard so your wrists are straight rather than at an angle with the keyboard. Sit up straight like your mother told you. Don’t slump. Habitually letting shoulders slump forward can lead to “dowager’s hump” and rotator-cuff injury. A lumbar support cushion strapped to the chair back can facilitate this. The cushion’s pressure on the lower back is a great reminder to sit erect. Train yourself to use the mouse with either hand, so you don’t overuse one hand. Even before I learned this about carpal tunnel, I taught myself to do this because of pain in my index finger from clicking and scrolling. I think the same thing could be true of using the touch pad repeatedly with the dominant hand. This next sequence of exercises continues carpal tunnel prevention and helps keep arms and shoulders limber. Do these once and hour while you’re at the keyboard. Put your hands in a prayer position, pushing toward your sternum and with your elbows raised to the sides. Hold for a count of ten. Release the prayer hand position and point your fingers downward stiffly, pressing the backs of your hands together. Hold for a count of ten. Repeat that sequence three times. 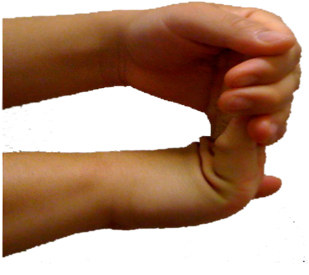 Similarly, as in the photo, grasp the fingers of one hand with the other and pull back, hold for a count of ten and relax. Repeat the sequence three times with each hand. 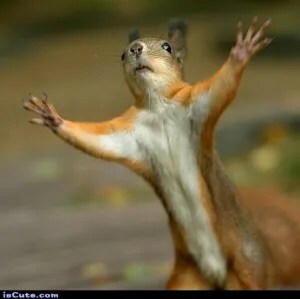 Release and shake out your arms and hands. Hold your arms out straight from your sides and roll your arms and shoulders frontward, then backward. Remind yourself to stand straight with shoulders back as if the lumbar cushion is attached to your back, shoulder blades pinched together slightly. Get up at least once an hour and walk around, go up and down stairs, more often if possible. I set a small timer for twenty minutes. A variation is to do gentle lunges, enough to tighten the buttocks but not enough to stress the knees. I do my silly walk down the long hall beside my basement office. When I began, to keep my balance, I touched the wall on both sides. The head weighs about the same as a bowling ball, so as we age, we need strength to keep it vertical. This exercise will improve posture and strengthen neck muscles. Sit or stand straight, shoulders back, in the posture I described above. Looking forward, pull your head back, chin down, turtle-like. Hold for a count of five, then relax. Do five repetitions. Do the set three times a day. And here’s the “hands up” in my title. This exercise will prevent the shortening of chest muscles and stretch your back. Sit or stand straight, shoulders down, shoulder blades slightly pinched together. Hold your arms out from your sides, elbows bent, hands pointed up so your arms form a big W, or wings. Pull your arms back and hold for a count of five, then relax. Do five repetitions. Do the entire set three times a day. I’ve worked the Wings and the Turtle exercise into walks with my dog. Sasha doesn’t notice my nutty behavior, and neither do the birds and squirrels along our dirt road. None of these should be too time consuming and should improve flexibility and decrease risk of pain from overuse. Lastly, pay attention to the body’s reactions, the movements and stretching of various muscles, and on your breathing. Focusing on the present moment and on the sensations created by the various exercises can reduce stress and increase the benefit of the activity. I invite commenters to suggest additional activities or exercises to add to the repertoire. This entry was posted in Susan's posts and tagged exercises, keyboards, Maine Crime Writers, stretching, Susan Vaughan, writing. Bookmark the permalink. I’m so pleased you find them worth trying. Thanks for your comment. As a yoga teacher, life-long fitness professional, and retired professor of Exercise Science, I agree with all of your suggestions. You have listened to the experts. Good advice. I’ve found that using a wrist rail is also helpful. and doing plenty of regular exercise, of course. It takes core and upper body strength to sit straight that way. Wow, thanks so much, Amber! I’m blushing with pleasure!